If you need a new recipe to spice up your dessert menu, we've got just the recipe for you. 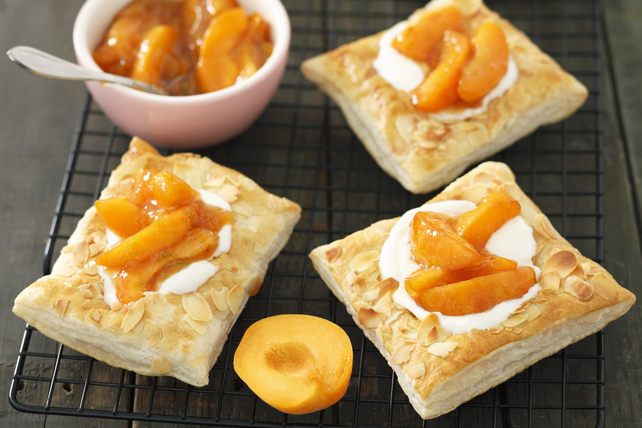 Our easy-to-make Puff Pastry-Apricot Squares are perfect for casual or formal entertaining. Unfold pastry on cutting board; cut into 8 squares. Place in single layer on parchment-covered baking sheet. Use tip of sharp knife to score lines, 1/2 inch from edges of each square; prick centre of each square with fork. Brush with milk; sprinkle with nuts. Bake 13 to 15 min. or until golden brown. Cool completely. Meanwhile, melt butter in medium skillet on medium heat. Add sugar and apricots; stir. Cook 5 min. or until apricots are softened, stirring frequently. Remove from heat. Let stand until ready to use. Top pastry squares with Cool Whip and apricot mixture just before serving. Let the (wrapped) frozen puff pastry sheet stand at room temperature 30 min. or until thawed before using as directed.